Barley is cereal grain whose starchy grains are used as food. It is usually as animals feed. It is also a key ingredient in beer and whiskey production and is widely used for malting. Different species have different taste.In German and English beer breweries, it is commonly contains two-row barley, and six-row barley is used in American breweries. Barley grain can also used to make non-alcoholic drinks such as mugicha and barley water. Barley is also used in soups and stews in Eastern Europe. Barley grass has many nutritional & healthy benefits. Recently, most Barley grass becomes a popular healthy food.Compared with wheatgrass It is more easier to digest. Nutritionally young barley leaves contain all the vitamins, minerals, antioxidants and detoxifying compounds, proteins and enzymes. In addition to chlorophyll and a bunch of vitamins, minerals and enzymes, it is also believed that barley grass have 3.3 times as much vitamin C, and 6.5 times as much carotene as in spinach, 30 times as much vitamin B1 as in milk, 11 times the amount of calcium in cow's milk, mostly five times the iron content of spinach, nearly seven times the vitamin C in oranges etc etc. It has been shown to be able to repair the DNA in the body's cells because it is contains an important element P4D1. P4D1 can help the preventing aging, and cell death. It is been proved by scientific that barley grass juice could be better than steroid drugs but has fewer side effects.For the patients, barley grass juice is a helpful diet supplement in a variety of illnesses, including migraine headaches,asthma,arthritis, fatigue and gastro-intestinal disorders,and also can help in clarifying the skin. It is also beneficial to the other illnesses for example blood clots, and diabetes.based on scientific paper published in Diabetes and Metabolism, regular consumption of barley grass is beneficial in reducing the levels of cholesterol and oxygen free radicals in the blood of type 2 diabetics. After drinking barley grass juice regularly, most people have obviously weight loss effect.scientist find that it is because of the enhancement of the cytochrome oxidase enzyme system which is essential for cell metabolism. After drinking barley grass juice regularly, many people said they lost weight. This is because barley grass juice can enhance the cytochrome oxidase enzyme system which is essential for cell metabolism. there is another enzyme: superoxide dismutase (SOD) in Barley grass. It is a powerful antioxidant, which can prevent the cells from toxic free radicals which is the primary culprit in aging and many other diseases. We can consume barley grass either as juice or as tablets. 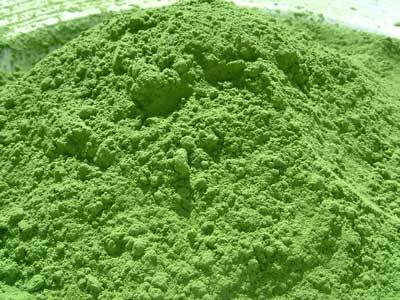 Like wheatgrass powder, barley grass powder can be easy to make barley grass juice.